Happy December and welcome to the kick off of the 12 Days of Christmas. Every week day in December you're getting a post from me. Exciting, I know. And although Three on Thursdays will remain the same, I'll otherwise be counting down to Christmas with holidays related tips and ideas. 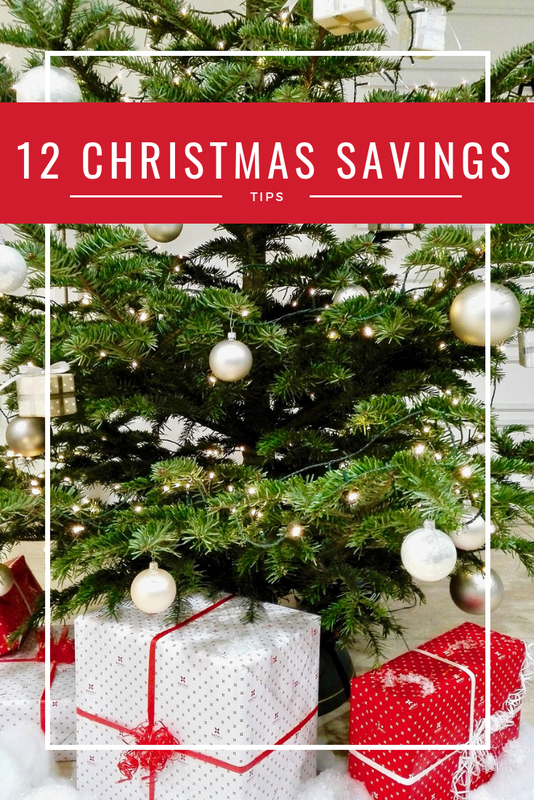 This is a super expensive time of year for most people, so I'm starting out with 12 ways you can save money this month. The post-Christmas sales are better than Black Friday, in terms of getting any holiday related items. But only if you actually need things of course. Make note this month of what you're missing - wrapping paper, stockings, a plate for cookies for Santa? They'll be pennies on December 26. Make do this year with what you have, and for next year you'll be totally prepared, for way less money. I got my gorgeous tree that way, it was a floor model from Macy's. This is definitely easier in a big city - Chicago has tons of free Christmas-y activities like ice skating, markets, tree lightings, parades, carolers, zoo lights, etc. Polar Adventure Days is my favorite, by the way, because you can play with the sled dogs. But just search online to see what free things are available near you. And remember that playing in the snow, looking at lights with hot chocolate in hand, baking cookies while watching Christmas movies, and the like are all festive and free or very cheap. This is two-fold, really. First of all, you're saving money up front on groceries when you eat simply. Those savings can be used to get all the extensive, fancier ingredients that you'll need for your actual Christmas or Christmas Eve dinner. You don't need elaborate meals every night! And secondly, planning and executing simple meals is going to stop you from eating out. This season is busy for people, between decorating, getting the kids to Santa, attending parties, baking cookies for school, etc. It's a lot. And once dinner time arrives, it's easy to be burnt out and out of time. If you already have what you need and know you can get it on the table in 20 minutes, you're much less likely to waste money on eating out. Not everyone needs gift. If you're looking to save money, this is where you can make the biggest decrease in your budget. The best gift I could get? Someone telling me 'hey, let's not do gifts this year. Let's just meet up for drinks in January. Or June.' That's what I want for Christmas, every year. And your kids don't need as much as you think they do. I remember almost none of what I ever got as a kid. Honestly, I remember the big things that lasted years - my red wagon, the white table and chairs I used to sit at and color. Think about how much you actually remember about what you received and plan accordingly. Seriously. Sending Christmas cards is not a requirement. If you don't want to do them, don't! They're expensive! We still get some cards, and I'll be honest - they go straight unto the recycle. Except the dog photo ones, like Steph, Kerry, and Tara. But even Steph is taking this year off. So don't feel like they are something so important to the people you send them to. You're saving time, money, and the environment by skipping this tradition. If you really don't want to miss it, either send an e-card (which is free) or send postcards, which cost much less in postage and don't require the additional expense of envelopes. Or less lights in general. They're a huge drain on finances in terms of your December electric bill. I still love outdoor lights and tree lights though, so the best bet there is to install timers or at least set reminders on your phone to turn things off before bed. Nothing needs to be lit up at 4 a.m. Or 8 a.m. And maybe you only run the outdoor lights on the weekends. Whatever works for you. You definitely already have something in your closet that's fit for holiday parties, Christmas photos, or church services. No need to be buying anything new. You can even wear the same outfit for multiple occasions by simply adding different cardigans, jewelry, belts, or shoes. It's so much more personal that store bought gifts, and you can save some serious money. Especially if you bake things and gift them early. Baking supplies are so cheap this time of year, and if you gift them early, like cookies for Santa, you take something off the recipient's to do list. Christmas travel is very expensive, particularly if you're flying. Stay home this year and invite everyone to you instead. But if you do need to travel, you can rent out space in your home for people who are coming to your city for the holidays using something like Airbnb. I already mentioned that decor should never be purchased until the after season sales, so in the meantime, just collect the natural, free decor. Meaning, the stuff you find outside. Pine cones, holly, pine for garland, if you live somewhere it snows, you can find all of this easily and not pay a dime. One of my favorites as a kid was oranges with cloves stuck in - a project my mom and I would do together. Smells so good, a fun activity, very cheap, and festive looking. If it's not your thing, don't bother. Wrapping paper and ribbon and gift tags can start to add up. My mom would always wrap just a couple of things that would sit out under the tree during December, but nothing that 'Santa' brought was ever wrapped. They would just set it out after I went to bed on Christmas Eve. I didn't need to unwrap every last thing, saving time, money, and clean up. One thing that can sneak into the budget at this time is all the donating. And that's a good thing. But if you're really squeezed for cash, consider all these other ways that you can still be charitable this time of year. Are you on a budget this month? What are you doing to save money?